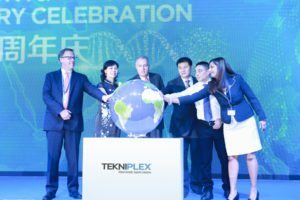 Wayne, Pa. (October 19, 2017) — More than 40 government officials and 60 representatives from pharmaceutical and medical device companies attended the recent grand opening celebration for Tekni-Plex, Inc.’s new state-of-the-art manufacturing facility in Suzhou, China, near Shanghai. Plant tours and a luncheon followed the opening ceremony. Caption (l to r): Paul Young, CEO, Tekni-Plex; Hu Dongying, chairman, Soundway Medical Appliances, Co., Ltd.; Russell Hubbard, general manager, Tekni-Plex China; Xu Xiaofeng, standing committee member of CPC Wujiang Committee, deputy party secretary and vice chairman for Wujiang Government; Tony Pei, vice general manager, Suzhou Yuwell Medical Equipment & Supply Co., Ltd.; Shilpi Biswas, vice president, American Chamber of Commerce, Shanghai. Earlier this year, Tekni-Plex announced a $15 million investment in the facility to support the growing needs of the Asia-Pacific pharmaceutical and medical device markets that are supported with products developed by Tekni-Plex’s Colorite, Natvar and Action Technology business units. Tekni-Plex senior management in attendance at the ribbon cutting included Paul Young, chief executive officer; Russell Hubbard, vice president-international and general manager; Ian Kenny, global managing director, Colorite; Johan Laureys, global vice president of Action Technology, and Bob Donohue, general manager of the company’s Natvar business unit. Xu Xiaofeng, standing committee member of CPC Wujiang Committee and deputy party secretary and vice chairman for Wujiang government, was also in attendance. The more than 140,000-square-foot (13,000-square-meter) facility is manufacturing Tekni-Plex’s Natvar, Colorite and Action Technology products. The facility features three Class 100K cleanrooms to accommodate medical-grade tubing and components production plus one Class 10K cleanroom that will produce Natvar’s pharma-grade tubing. The facility is in the process of commercializing Natvar’s recently-announced silicone extrusion tubing for catheters, feeding tubes, drug delivery and peristaltic pump applications. Production for microextrusion tubing that targets a wide variety of demanding neurovascular interventional therapies and surgical applications is expected to be on stream early next year. The facility will also manufacture Colorite custom compounds for medical device applications, and Action Technology’s dip tubes used in a wide variety of food/beverage, pharmaceutical, personal care, industrial and household pump applications.